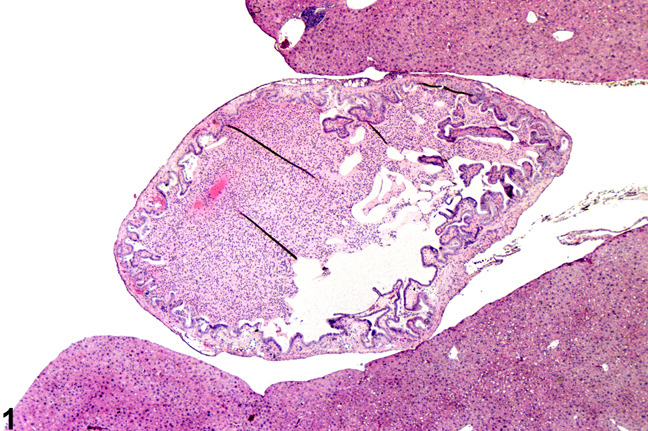 Gallbladder inflammation in a female B6C3F1 mouse from a chronic study. 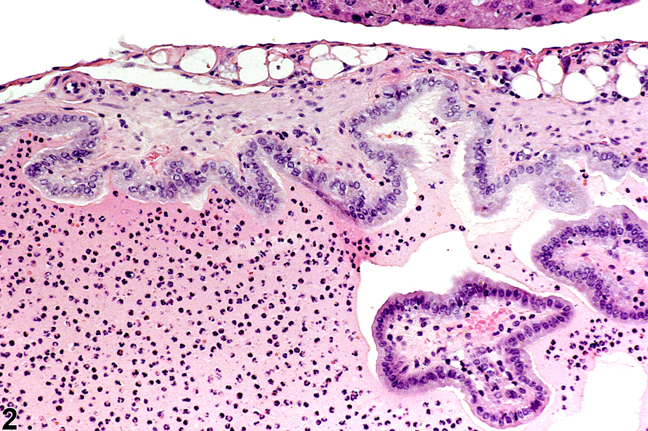 Gallbladder inflammation in a female B6C3F1 mouse from a chronic study (higher magnification of Figure 1). 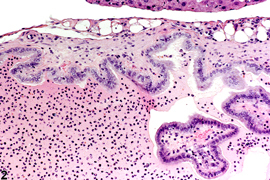 Gallbladder inflammation in a male B6C3F1 mouse from a chronic study. Gallbladder inflammation in a female B6C3F1 mouse from a 28-day study. 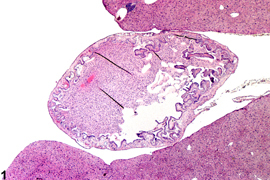 Gallbladder inflammation in a female B6C3F1 mouse from a 28-day study (higher magnification of Figure 5). 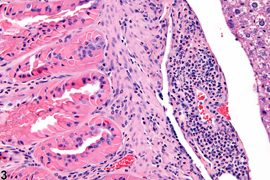 Inflammation of the gallbladder may involve acute inflammatory cell infiltrates in the lumen ( Figure 1 and Figure 2 ), but more commonly inflammatory infiltration occurs primarily in the gallbladder wall and is accompanied by hyperplasia of the mucosal lining. 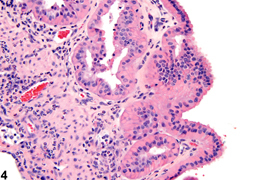 Figure 3 and Figure 4 show dense cytoplasmic hyaline deposits in the hyperplastic epithelial lining of the gall bladder. 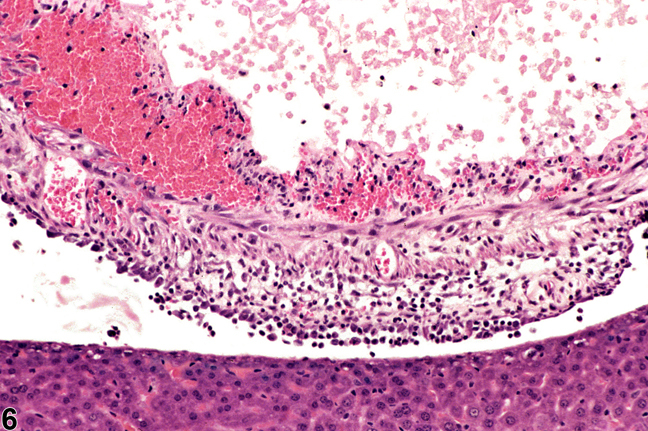 Inflammation of the gallbladder (cholecystitis) may be associated with mucosal ulcers or erosions and hemorrhage ( Figure 5 and Figure 6 ). 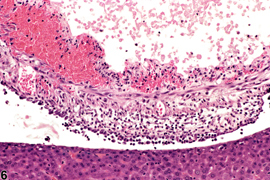 Cholecystitis is more commonly seen in older mice. Inflammation of the gallbladder should be diagnosed whenever present and given a severity grade. 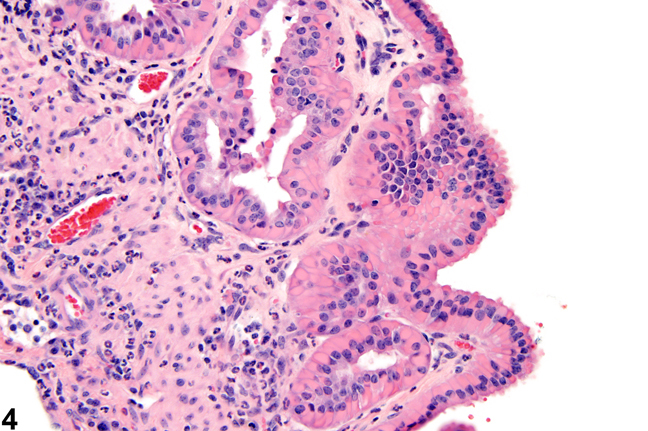 A modifier describing the character of the inflammation (i.e., acute, suppurative, chronic, chronic active, or granulomatous) should be included in the diagnosis (for a description of these modifiers, see “Liver – Inflammation, Focal”). 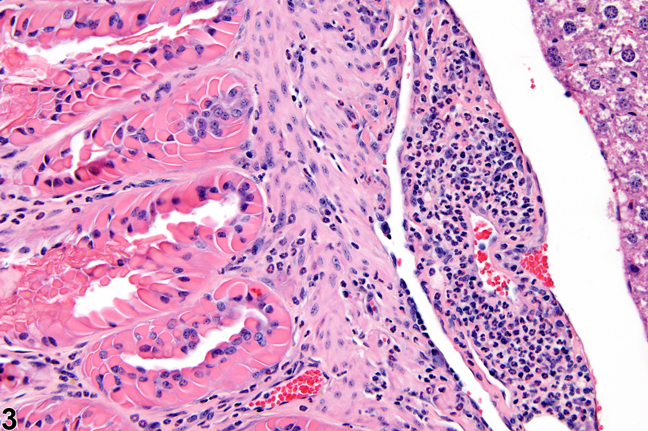 The character of the inflammation and any other morphologic features should also be described in the pathology narrative. 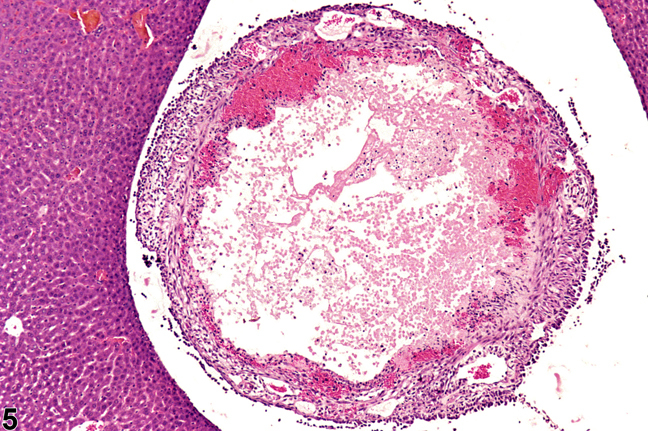 Accompanying lesions, such as ulceration or hyaline droplet accumulation, should be diagnosed separately if sufficiently prominent.